I made this colorful owl ornament at the request of a friend who needed a little gift for an owl-loving buddy. I used that delicious American Crafts smooth glitter paper, and sequins to add some shine and pizzazz. Today is all rainy and icky, so I need a little glimmer to look at. Here's a close-up of the owl, which is just ink and watercolor on watercolor paper, then cut out and stuck on with stickyback foam. I think the colors turned out pretty well. Bright, just how I like 'em. Oh, I know what you all are thinking, "Kira, you have not been posting enough toucan crafts lately, shame." Well, to make up for that, here is a watercolor painting of a toco toucan and his little budgie friend. They're best friends. happy Friday! Wheeeeweee! This weekend was been crazy-go-nuts! My wicked witch bookmarks were featured on the Reader's Nook facebook page on Friday morning which resulted in an excellent number of sales... So I've spent most of the weekend busting my booty filling orders. I am tired, but happy and grateful for the business :) And I've gotten SO GOOD at making bookmarks! Haha! So the crafting plans I had for this weekend got put on hold, and I have to post this card that you may have already seen if you did the last Stampotique Blog Hop. I haven't shared this card here, yet, though. So I feel okay about posting it now. I needed to do a little bloggage tonight and realx and plot my crafting mischief for this upcoming week. So I really like this card, and this new stamp! And I can't get enough of this glitter paper (the sparkly gray burst shapes coming from the center in the background. It's American Crafts glitter paper. I was sent a little 6x6'' sample of it by Unique Crafters, went loco over it, then searched and found more on clearance at hsn.com. Score. Anyhoo, I had a pretty great weekend. I hope you did, too. PS. I really, really, really appreciate you lovelies who read my blog and look at my stuff and have such kind things to say. I love you guys, am grateful, and I don't think I say it enough. When Bobby left for work today, I told myself that I was not going to do anything today, since I was feeling awful blegh. So after reading some sci-fi and lounging in bed for a while, my mind started turning because it was a mess downstairs and I hadn't cleaned up from lunch yet...So I got up and tidied up downstairs and did the dishes. Then I realized that I needed to go to the post office... To get it out of the way, I just went. Then I got there and I had left my wallet at home and had to go back and get it. LAME. So finally, when I got home, I told myself I'm REALLY not going to do anything else today, not even crafts. That didn't last long. I made a toucan. This is my second needle felting project, and I'm really enjoying this new craft! I credit Felt Me Up Designs for the wee toucan that I bought, and all the inspirational felty goodness. Here's the back, I used two tones of purple wool, even though real tocos don't have wing spots. Wait, real tocos aren't purple either. I guess I'm okay, then. This is a happy looking bird! I'll admit, he made me feel a little better. I'm wanting to find a little glass cabinet to house my growing number of little toucan thingies. I'll have to remember that come Christmas time. Ooooooh, Halloween is coming!!! I know, I know, it's early, but I can start the crafting fun. I made a set of Halloween themed ATCs using various monster stamps from my line over at Stampotique. All of them have Owl Tree #4018 as part of the back ground. Whats fun with that stamp, is you can flip it over, and BOOM. The owls are bats. Spooky, huh? I used embossing powder for this background, too, on the spiderweb. And finally, how appropriate for Halloween, a little monster with a sweet tooth. Halloween cannnndy! It's already in the stores, tempting me... I love Snickers... I hope everyone has a great week! Hey guys! You've seen me do posts and link to challenges on The Unique Crafters Challenge blog. I'm really loving being on their design team! It's super fun to play every month. Please hop along and check out the blogs of my fellow DT members and enter to win a free digital stamp image for each radical site that you visit. Simply check out the blogs on this list, find the blog hop post on each blog and leave a comment with your name. You will be entered to win a prize for each of the blogs you visit and comment on. You have until Sunday, September 30th to enter. Please, only enter once per blog. And REMEBER! This month's challenge is "Anything Goes", so head over and enter something! There are TONS of prizes this month. Watch for the winner announcement post on the Unique Crafters Challenge Blog on October 7th along with our other prizes for the month to see who won. After finding Feltmeup Designs and treating myself to this sweet little felt Toucan, I was inspired to give 3D needle felting another go. My first attempt, I quit after making a blob. Silly me, I thought I could just figure it out, but this time around, I watched some vids on YouTube and actually made a REAL attempt. I'm pleased as punch! I made this teeny tiny replica of my sun conure, Peanut. I didn't realize how SMALL of a piece of felt the fibers would become once it gets going with the felting. You start out with this big fluffy puff, then get a firmly packed little shape. Thus, the size of my little bird. It only turned out about 1.5 inches tall. I cheated a little on the wings and used a little bit of yellow felt. I had stabbed myself quite a few times working with the tiny bits of wool, and I was getting a little tired. I think he has a kind of smug look to him, just like the real Peanut Button. Not bad for my first needle felted creature. Bahaha! When I showed it to Peanut, she was so scared. "What.... is....THAT?!" It's no use, Peanut is endlessly suspicious of this little feltie doppelganger. I hope everyone is having a splendid week! 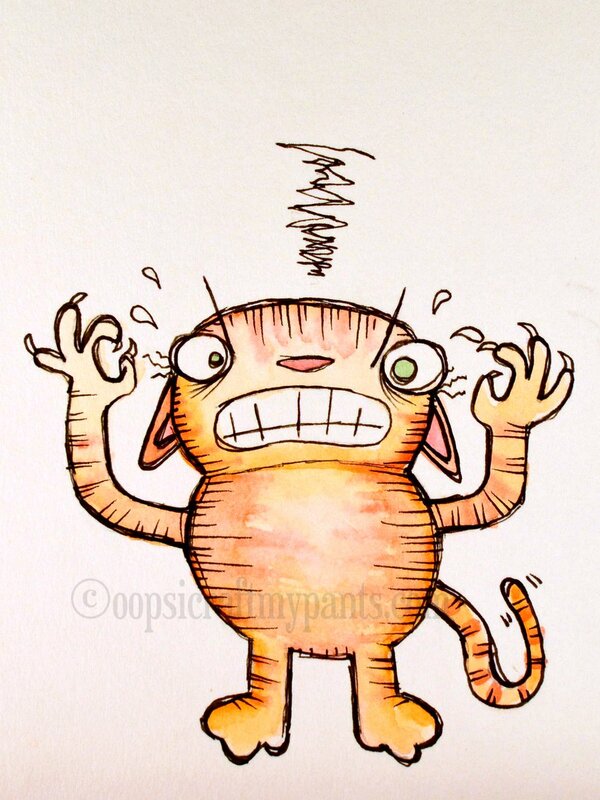 I was commenting on blogs earlier in the week, already having an emotionally draining few days, and then had to draw this angry little kitty. Why? 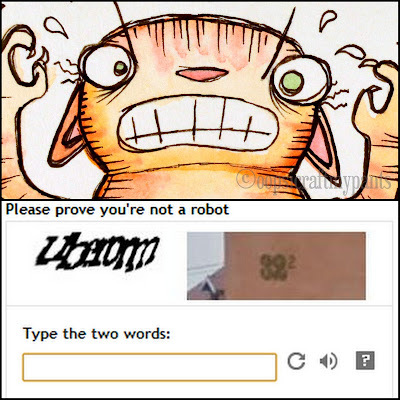 I TYPED THE WORD VERIFICATION IN WRONG LIKE 5 TIMES IN A ROW, AND THE INTERNET WAS CALLING ME A ROBOT!!!! I have such a hard time reading that garbled nonsense. One of my biggest pet peeves is captcha, but I deal and accept it as a necessary evil, because I enjoy leaving comments. It's just one of those things, haha! It's a personal choice, (and absolutely no hard feelings or fewer comments if you don't, and I am not pleading to anybody in particular, just the blog world in general) but.... if you feel so inclined to disable the word verification on your blog, that would be a happy thing :) I only get a spam post or two a couple times per year, and I don't have captcha on, if that does offers any reassurance. Pretty please? With a sugar on top? PS. I don't mean to offend anybody with this post...but....but...but....captcha kills me! How to Watercolor Drawings and Stamped Images Video: ROOSTER! Please subscribe to my channel, if you wish :) And feel free to ask questions if I wasn't clear on anything. Thanks for watching!!! It's September, and that means I can officially start getting excited for fall and winter holidays :) I chose a darker color for this month, since the days will start getting shorter, and this color will start getting me in an Autumnish mood. This owl was clipped from a Harry Potter daily calendar page that my friend Audio sent me. Whenever I see a picture of a hunting bird with talons out-stretched, it makes me think, "TICKLE FIGHT!" Hee hee! Well, happy September, folks :) I hope it's full of fall magic and fun. Eeee, I'm excited for Halloween Crafts!!!! CLICK HERE to see all the NEW stamp images that are available now from Stampotique for Sept 2012! This includes 10 more images from me (plenty of fun monsters), as well as some other awesome releases from the delightful Stampotique Artists! 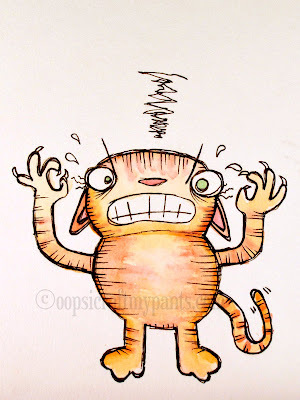 If you want to see the stamps in action, Stampotique is doing a huge blog hop. Start at this link HERE! I had the pleasure of participating in another awesome wicked Craftster swap which was themed "Wicked Children." The whole idea was to come up with a list of villains or wicked characters you'd like to see depicted as a little kid. My partner had a pretty awesome list, and I picked to craft a young Queen of Hearts from Alice in Wonderland. I don't often draw people...So I was a little nervous working on this, BUT I think I captured the deviousness of the little queen as she stews ideas about playing croquet with hedgehogs and flamingos. I saw these little resin roses at Michaels and thought they went with the theme perfectly. I used a pop-can tab for a wall hanger on the back. And in other Alice in Wonderland-related news, I found this tremendous monster of a caterpillar in my yard today, on a big toadstool, blowing smoke rings from a hookah. He looked just like Absolem, but green. He refused to be photographed smoking, so I had to make do with taking pictures on a stick. Really though, he's an imperial moth caterpillar and he weighs about 3 lbs. Just kidding. He was huge, though. Happy September 1st, everyone! You know what that means, a new challenge is open over at the Unique Crafters Challenge Blog. This month is "Anything Goes", which means you can post up to three links for any paper or digital craft project you have designed during the last three months. And September's prizes are PLENTIFUL! There will be 20 different awards, so you have lots of chances to win. This challenge is sponsored by Scrapbooking Unique. For some inspiration, I made this little mixed media card inspired by Cinderella. The image is actually from a vintage Disney storybook, and that actually is Cinderella :) For extra sparkle, I used 1/4'' sequins.